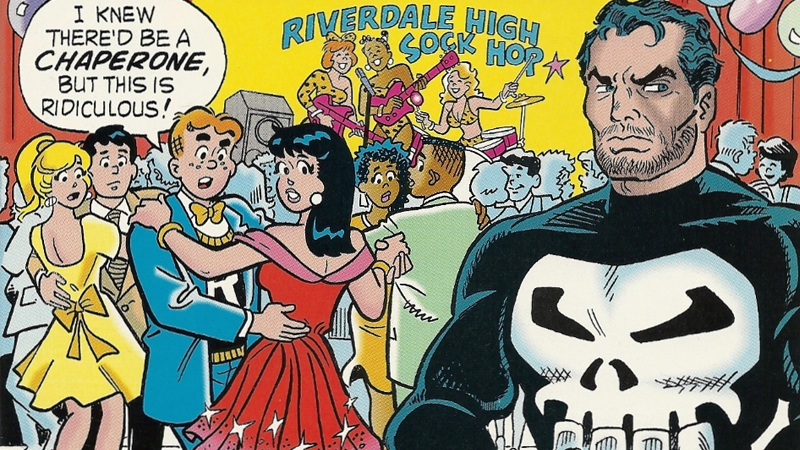 The cover to Archie Meets the Punisher, by Stan Goldberg and Henry Scarpelli. Marvel is one of the biggest comics publishers in the world. So why would it need Archie Comics to release new collections of its own books? The reason behind a new deal announced today is not as bizarre as it might seem. Announced today through a press release at Publisher’s Weekly, Marvel is teaming up with Archie Comics to start selling a new format of Marvel anthologies called Marvel Comics Digest, starting in July. With six releases a year, the range, which features reprints of Marvel stories in the digest format, will be bundled in themed collections covering big heroes like Spider-Man and the Avengers (the first two digests), the X-Men, Iron Man, Black Widow, and more. So this brings us back to the question... why is one of the biggest comics publishers around turning to Archie Comics for this? There’s a few reasons. First, Archie Comics’ bread and butter for years and years has been releasing Archie digest collections—it’s not a format Marvel is particularly familiar with. On top of that, the aimed goal of these digests is to exploit an area of retail that Archie Comics is very strong in: sales at news stands and in supermarkets. While comics giants like Marvel and DC have retreated into selling their comics in specialty stores over the past couple of decades, Archie is one of the very few comics publishers who haven’t stopped selling their comics there, giving the company a huge reach to an audience that Marvel doesn’t typically reach out to. That means, as the Marvel movie universe has flourished and millions more people have become familiar with Marvel’s roster heroes, access to current comics featuring those characters has actually been harder for non-comics diehards. Someone who only knows Iron Man from Robert Downey Jr.’s performance is way less likely to go into a speciality comics store and start reading Invincible Iron Man, but if they saw those heroes on shelves at the local supermarket? They might be inclined to pick up a collection. Essentially, by doing these digests, Marvel gets to use Archie Comics’ already-established reach within a very large market, without having to slowly build up their own presence in those markets again. And Archie gets the benefit of being able to put out books with some of the most recognizable superheroes in the world on them. It might not be a sequel to Archie Meets the Punisher, but it’s a good deal for both Archie and Marvel.